Thousands of California teachers scheduled for layoffs. SACRAMENTO, Calif. -- California's budget crisis could cost nearly 22,000 teachers their jobs this year. Yes, it is. He has it right. But California’s real problem isn’t in charter caps or in barriers to the use of student test scores in evaluating teachers, stupid as those barriers seem. . Even where test scores can legally be used, there’s no certainty that they can be used wisely. Nor are charters any magic bullet: Some are excellent; many are no better than comparable public schools in their student outcomes, and often worse; some are rip-offs. What’s currently tripping up California in Washington is that the state has been caught in a shell game. While the state acknowledges that the state is spending less per student this year than last (and will probably be spending still less next year), the governor claims that it’s spending an equal portion of its general fund on schools as in the past and thus is not failing in maintenance of effort. In addition, the feds raise a series of other accounting questions about the state’s application for a new round of federal stimulus funds, funds which are conditioned on the state’s fulfilling the maintenance of effort commitment it made when it got the first round of education stimulus money last year. Until it answers the questions, the feds say, no decision will be made on whether California will get another round of federal stimulus money. And under that problem lies a more fundamental one: the state’s chromic unwillingness to adequately invest in its schools and its ongoing disinvestment in its colleges and universities. Depending on how you count we’re now somewhere in the forties among the fifty states in what we spend per pupil in our K-12 schools – far below the U.S. average, and even further below most of the major states -- and lower than that if you measure education spending as a percentage of income. How short-sighted and stupid. Peter Schrag, whose exclusive weekly column appears every Monday in the California Progress Report, is the former editorial page editor and columnist of the Sacramento Bee. He is the author of Paradise Lost: California’s Experience, America’s Future and California: America’s High Stakes Experiment. His new book, Not Fit for Our Society: Immigration and Nativism in America will be published in 2010. By SAM DILLON, NY Times. March 10,2010. “A panel of educators convened by the nation’s governors and state school superintendents proposed a uniform set of academic standards on Wednesday, laying out their vision for what all the nation’s public school children should learn in math and English, year by year, from kindergarten to high school graduation. So, the professional edu wonks ( not teachers) have again found the solution. How nice. The effort will have little effect in California. California has some of the nation’s highest standards, and lowest test scores in reading and math ( about 47 out of the 50 states depending upon the year). This is the politicians ( and their consultants) approach to school improvement and it will not teach a single child in California to read or do math. Over 2000 union faculty, students and their supporters rallied at the California State Capitol in Sacramento today in support of adequate funding for public education , both k-12 and higher education. the rally was one of more than 40 events across the state asking people to Stand up for Education. Faculty and students came from U.C. Davis, Santa Cruz, and Berkeley, as well as CSU Sacramento, Chico, and local community colleges. 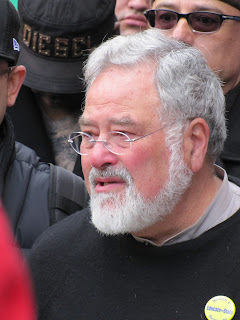 George Lakoff, well known for his works on framing issues argued for signing petitions for the California Democracy Act which would reduce the requirement to pass a state budget from the current 2/3 vote to a simple majority. 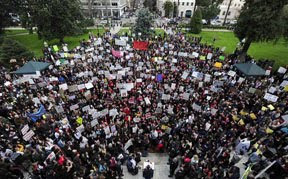 Lakoff asserted that the demonstrations will mean little unless the California Democracy Act gets on the ballot by April 12 and passes in the November election. That is the only way that revenue can be raised to fund California's needs, including education. Lakoff criticized leaders of the California Democratic Party for not getting enthusiastically behind the initiative. The California Democracy Act is simple. It changes just two words in the Constitution: "two-thirds" becomes "a majority" in two places. That's all. The initiative is one sentence long: "All legislative action on revenue and budget must be determined by a majority vote." It's simple democracy. And because it is a ballot initiative, a simple majority can bring democracy by eliminating the two-thirds vote requirements. The initiative has until April 12 to gather over 600,000 signatures of registered voters. At present the campaign is far behind. Lakoff argued that an on-line campaign which would ‘go viral” was needed to push the initiative over the required signatures. Students, faculty, workers and public education supporters protested deep cuts to education funding on March 4, 2010. The California Faculty Association (NEA) is one of the organizations that participated in mobilization. CFA represents the faculty on the 23 campuses of the California State University. Public education and public services need adequate funding to meet the urgent needs of people in California and the U.S. The 2008-2020 economic crisis has forced the cutting of higher education, of k-12 education, and of social welfare systems. What caused this crisis ? It was caused by the greed and avarice of the financial class and aided by y the politicians of both major political parties. In 2007- 2008 major banks and corporations looted the economy creating an international meltdown. Now, they have been rewarded with bail out money. The crisis was not caused by students, teachers, public employees nor recipients of social security. Now we have cuts in parks, in universities, in nurses, libraries and police protection. School children did not create this crisis. Foster care children did not create this crisis. The protracted economic decline has had a devastating impact on the California budget- and the budgets of 42 other states. Revenues have continued to plunge and legislatures have been forced to make a series of deep cuts to virtually all of the state's programs, including the university systems.